Spaces are extremely cramped and difficult to back in. I upgraded to a patio site because of the reviews I read about the tight spaces. I am glad I did because I don't know how my 35' trailer would have fit in a standard site. Even in the patio sites you are right on top of the rigs next to you. The clubhouse and pool area are nice. They have good activities. This campground has more manufactured homes than RV sites. Park is next to the Tucson loop bike path and if you love to cycle then there are miles and miles of trails to ride. A Fry's store is up the street as well as a Walmart a few more minutes down the road. This park is rated as a 10 and I would give it a 7, maybe an 8. I paid for a week but left 2 days early to visit Tombstone and stay at another RV park that offered larger sites. I would not stay here again. The park office was not open when we arrived, therefore no internet. And when we did get the information for the internet, it was so slow I never could use it. The person we spoke to didn’t know if we could stay for the two days we planned on, and couldn’t really answer too many of my questions. There was no price list of sites on the website or even what the sites really looked like. The sites are very close together and for large rigs very hard to get into. The person we parked next to slide out took up so much space, we weren’t able to park our car in the space provided. The park is mostly full timers, which we didn’t mind. It is very clean and the club house shower rooms are very nice. We did not use any other amenities of the park. I don’t think I would stay here again, I would like internet that works and more space. Really with the technology Internet should work! Well managed and clean. Not a good choice if you are not a dog person. Barking starts about 7:30 AM. Many dogs. Sites are silly small. Where we had to park our truck had no more than 8" clearance between a brick wall and the slideout of the rig next door. Tight space to put a 3/4 ton truck...plus our bumper just touched out into the road even though we were fully pulled in to parking spot. What is great is location. Close to the Catalinas, Sabino Canyon, Saguaro Park East. Good organized activity schedule. This is a fabulous resort! So many things to do you cannot possibly be bored! The staff are very cheerful and helpful, all facilities are very clean and well- kept. People are very friendly and welcoming. 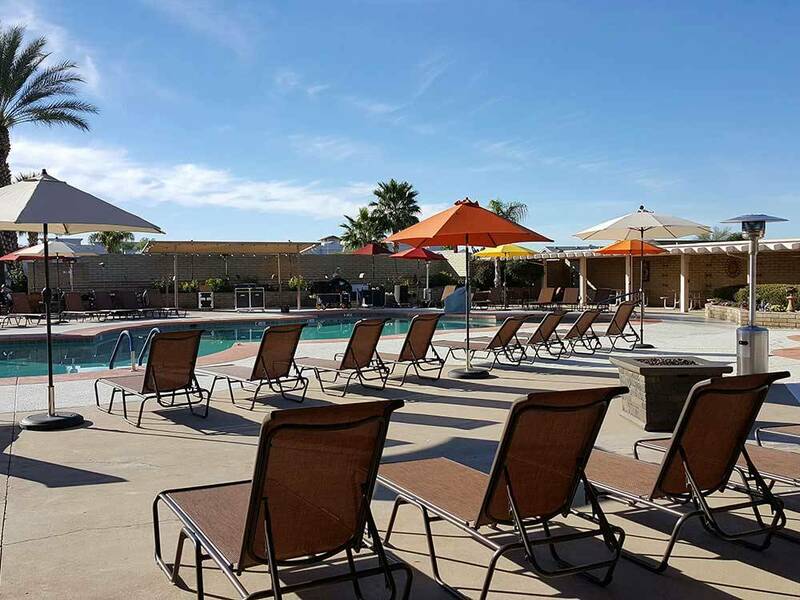 Great pool and hot- tub - we got a surprise one day when the staff served us free wine as we lounged by the pool :) You can walk to shopping or drive and take in everything Tucson has to offer. The nicest RV park our family (two kids, two adults) has stayed at! Fabulous helpful staff, loads of activities for all ages, resort feel with relaxing pool & palm trees, the fanciest campground restroom ever! We stayed in the spring time in our travel trailer in a back in site within walking distance to the pool! Nice space with cable, patio & stone picnic table including a porch light! We didn't bring pets this time. Our resort homes are intelligently designed, solidly built and beautifully finished. You'll find park model homes for sale, offering the perfect customized living solution for an extended stay or entertaining houseguests.